Little breaks help. Looking for laughs is an important emotional fitness skill. When you can’ t laugh, your emotional health is in big trouble. 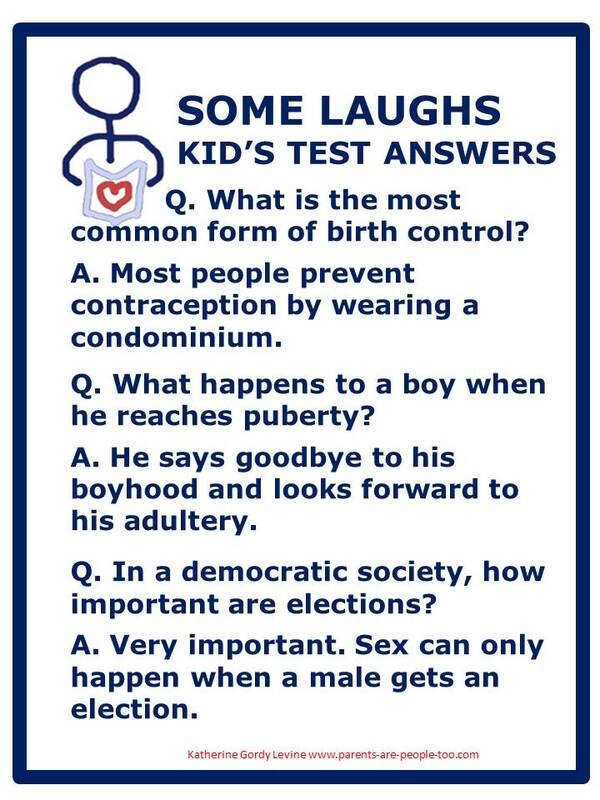 See if these jokes about some kids’ test answers tickle your funny bone. These are a short version of what can be found on The Laughing Housewife’s recent post. She was sent them by and I stole the best. Thank you,Tilly and. For all who struggle with major life blows, laughter is impossible. When you can laugh again, you have put a foot or two on the road to better emotional health. The most devastated from any life blow are not reading this. If you were closely involved in one, and are reading this you are back on to the road to emotional health what I mean when I speak of emotional health or emotional fitness. Tip one: Laugh with and not at. This models healthy laughing. Tip two: Remember age and stage as well as temperament. Figure out what gets a child laughing. Both, my grands are under three. A bit of gentle rough housing, a jack-in-the-box, peek a boo, tickle time get them laughing. Poopy jokes seem to come in to the game around five and six. Animal jokes, Knock, knock jokes work for the school aged kids, teens get irony and satire. Tip three: Make a point to watch cartoons and funny movies with your kids. But also point out nasty humor or make-believe stuff that seems to hurt others. Tip four: Laugh at yourself, learn a few throw away lines from some self -deprecating comedians. Sometimes I even go there which makes the grands laugh. Tip five: Remember a kind and caring sense of humor is a sign of emotional health. If you can’t laugh you need more support and possibly therapy. Tip six: Remember to take little laughter breaks but also at least once a week to take a day full of me-time, family and friend time, quiet time, laugh and play time. Parenting is difficult and often a struggle as you must know by now. All sorts of feelings surface. Some make you laugh right then and there. Some you can laugh about after a bit of time has passed. Some cannot be laughed about. Try my tips to add laughter to your life and your child’s life. Also visit my Daily Twelve Emotional Fitness Exercises for more hints about staying strong. Remember that liking, commenting, or sharing is an act of social media kindness. It strengthens you and helps me and others. Maybe this will help some one laugh. This entry was posted in Self Care, Take a Break Time and tagged Emotional Fitness Training, Katherine Gordy Levine, Laugh or play, parenting, Parenting advice, Parents Are People Too, postaday, Self care, Thinking about what matters. Bookmark the permalink.